I have wonderful news, eat in my kitchen is in the final of the Kitchn’s “Best Daily Read Cooking Blog” together with nine other blogs! Thank you for your support and help to come so far! 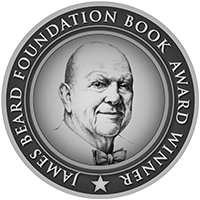 It would be great if you could vote (one last time, I promise) for the final vote of the “Best Daily Read Cooking Blog” here. A few weeks ago a very sweet lady, Marilena, got in touch with me. It was the day I wrote about Mussel with Ginger, Lemon Grass and Coriander and we got to talking about seafood recipes, cakes and olive oil. At one point she asked me if I would like to try one of her cake recipes, the Milk Pan di Campobasso. Marilena lives in Italy in the Molise region (in the Campobasso province) which is north-east of Napoli. She loves to bake, beautifully decorated cakes for weddings and special events and she produces her own olive oil, Marilena has 300 olive trees! She already sent me some of her wonderful extra virgin olive oil which is divine, a few drops on fresh bread and some salt, delicious! So finally I baked her cake, Marilena’s Milk Pan di Campobasso. 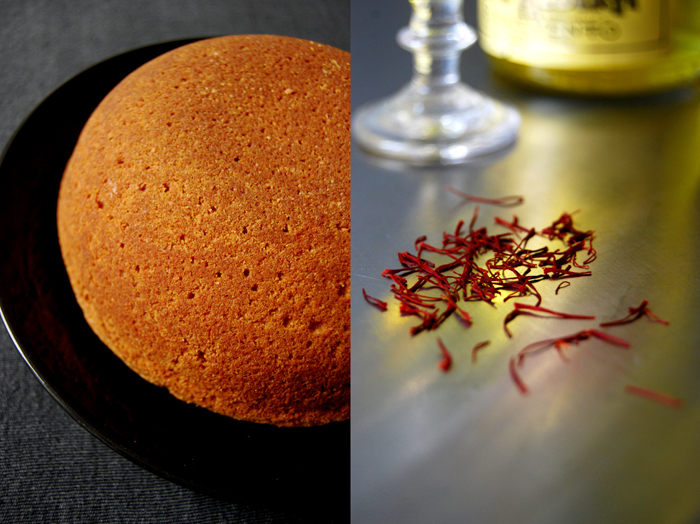 I was excited, it’s a special recipe, a traditional Dolci del Molise and it required a few preparations. First I had to get a special liqueur, the Italian Strega (meaning “witch”) which is a herbal liqueur produced since 1860, bright yellow made with saffron, mint and fennel. I ordered it and when it arrived I prepared the “liqueur milk”. A mixture made of milk, Strega liqueur, sugar, saffron, vanilla and lemon peel which has to sit overnight, it gives the Milk Pan its typical taste and yellow colour. The cake is baked in a dome cake tin, it’s very juicy, a bit moist but still light. 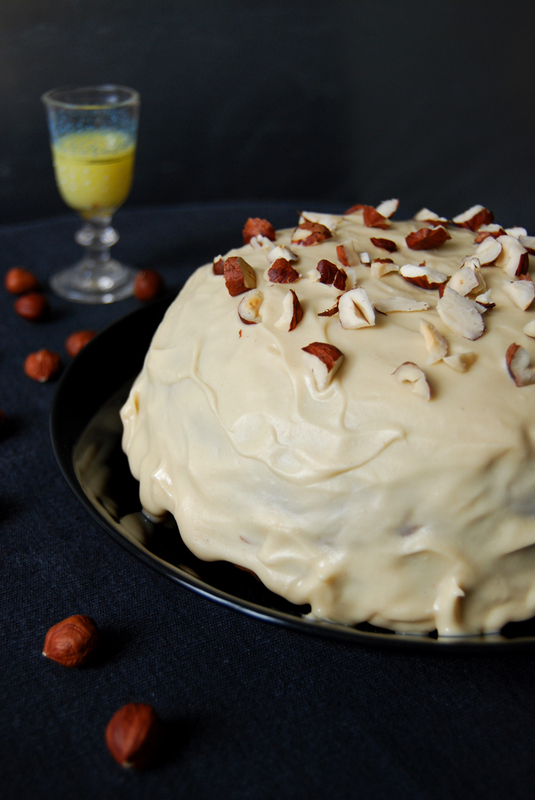 It is covered with a glaze of nocciola cream, a hazelnut spread, mixed with white chocolate and sprinkled with hazelnuts. It’s hard to describe the taste, it’s the taste of Italy, wonderfully sweet and aromatic, with a slight hint of saffron which is a great match to the hazelnuts. I love it, thank you Marilena! 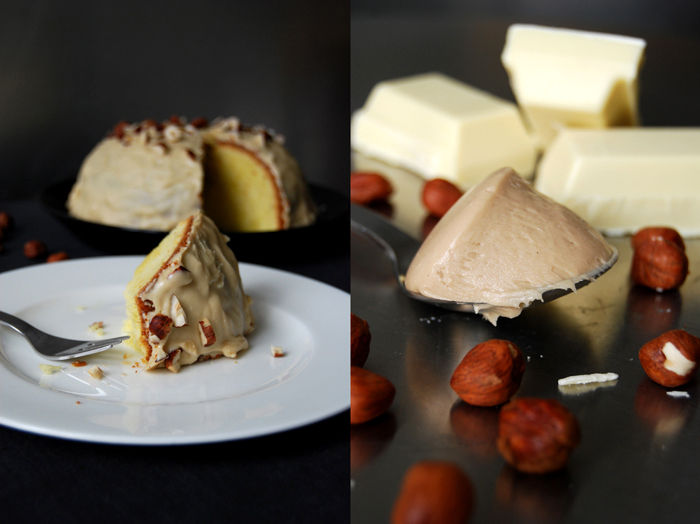 For this cake you need a 1 liter dome cake tin (mine is ceramic, you can also use a metal one). I made more liqueur milk than I needed for the cake as I want to use it for other dessert recipes as well. You will need around 50ml (one espresso cup) of this mixture for the cake. 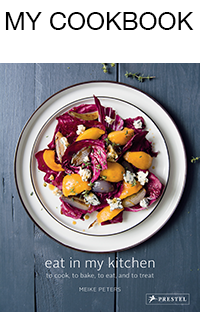 Mix all the ingredients in a bowl, cover and let them infuse overnight. In a sauce pan, melt the chocolate on low temperature and stir in the hazelnut spread and oil. It should be smooth and liquid, if it’s not liquid enough you will have to add a little more oil. Set the oven to 180°C / 355°F ( (fan-assisted oven), butter the dome cake tin and sprinkle with breadcrumbs. Beat the egg whites with a pinch of salt till stiff. Combine the flour, potato starch and baking powder. In a large bowl, beat the butter and sugar till fluffy, add the egg yolks, one at a time. Stir in the dry ingredients and the liqueur milk and continue mixing until well combined. Gently fold in the egg whites. Scrape the dough carefully into the prepared tin and bake until golden. Check with a skewer, it should come out clean. Marilena told me to check it after 30 minutes, mine needed 55 minutes. The baking time depends on the shape, size and material of your tin. Let the cake cool (I put the tin in cold water which makes it easier to take the cake out), carefully flip it over on a big plate and ice it with the hazelnut chocolate icing. 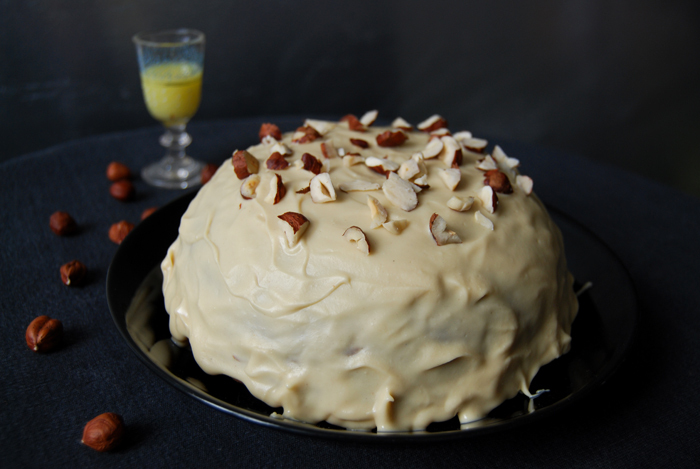 Sprinkle with hazelnuts and enjoy its beauty (and taste)! I am from the province of Campobasso, too. 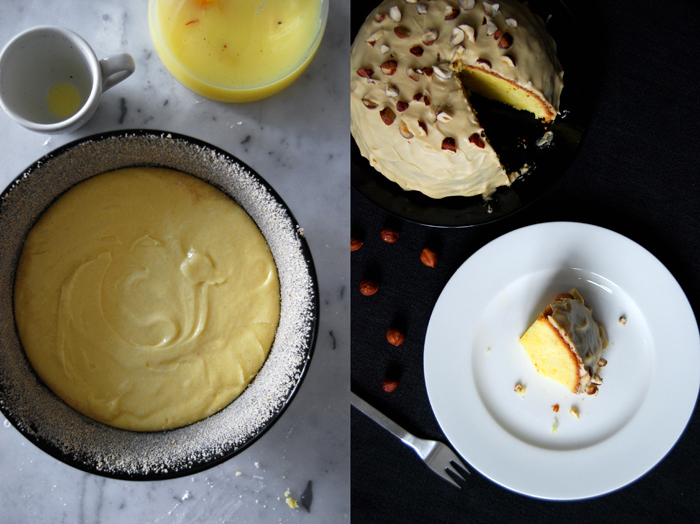 I really love this recipe since I enjoy Milk Pan so much! Meike, I voted. Good luck again, you are so close:)! The cake looks worthy of a special occasion. I love reading authentic regional recipes. Thanks for taking time to make it and share. I was so happy when Marilena asked me to bake this cake, it tastes so good and looks so beautiful. 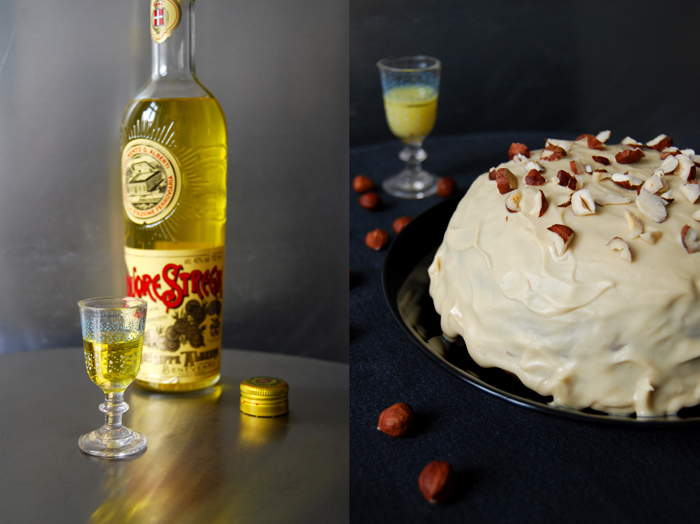 The saffron liqueur milk is great for desserts, very aromatic!